A controversial entry originally, but which was eventually the result of a development which became too difficult for the original team to complete. 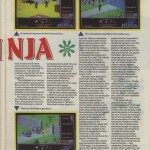 Hugh Riley and Mark Cale shed light on the original Last Ninja and what happened…. 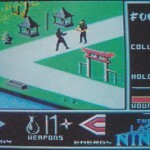 Casting things back, it was claimed some years ago that Last Ninja was originally a game by an Hungarian team, which was to have System 3 as the publisher. The rumor was that the team had sent System 3 an almost complete version for testing, and System 3 finished it off and published it. Further to this, another Hungarian told the story of how he spoke to a mathematician who claimed to be part of the original LN development crew. The mathematician backed up his claim by demonstrating the Level editor system used to place trees and other objects into the game. “I couldn’t believe my eyes! He told me, that for example Shogun on the last level moves so “dizzy”, because they couldn’t finish it. They sent the program out for testing (or checking to Germany or England I’m not quiet sure), and they stole the whole program, after they finished quickly and released before the Hungarian group finished the same. Was any of this true? Well, it was declared as complete rubbish. “When I came onto Ninja 1 it was being programmed for System 3 by a subsidiary of Andromeda in Hungary (Caesar the Cat? now there’s going back!). Bob Stevenson had done some mock up screens for the adverts then left. I spent 3 weekends in Budapest (still behind the iron curtain) where it became apparent that their programmers were having difficulties. 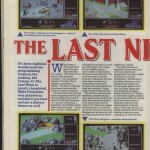 GTW also got in touch with one of the original developers of Last Ninja, István Bodnari, who confirmed the level editor, but didn’t know its existence now. Nothing was mentioned about the game being stolen though, so we believe that nothing bad actually happened. He even confirmed that the graphics were all supplied by System 3, so it confirms Andromedia were developing the game FOR System 3, and it was not a game that System 3 were trying to purchase from them. “I wanted to put a close to the idea that Hungarian team wrote and finished 85% another Last Ninja. Hugh Riley will tell you they tried and failed. Currently we are making a number of videos from people we have worked with including Andromeda about all our games. Andromeda’s Robert Stien will state on video that he refunded all the advances we gave on Last Ninja as they failed to even get a ninja sprite Hugh drew to animate let alone fight. The only game ever finished by them was IK on the Atari ST and that was only after I sent both Archer Maclean and Bob Stevenson to Budapest. Frustratingly there was no Ninja character to move or fight with other characters! So there we have it. We’re unsure how some of the original stories came to fruition, but it is a chapter that can sort of be closed. 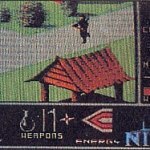 Regardless of the controversies there could well be another version of Last Ninja out there, and we would love to find this early version. But it sounds like essentially it would just be a broken version of the game we all know and love, with the same graphics and maps that Hugh had done. It would be only interesting from a historical point of view. 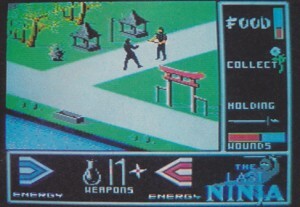 The large screenshot with rather different looking background elements and a score panel which is vastly different in the gallery was confirmed to be an original concept screenshot. 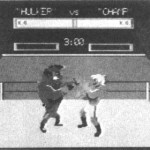 This was drawn by Bob Stevenson and was published in magazines like CVG announcing the game. When Bob left the project, Hugh took over and re-did some of the panels and graphics, but essentially the end result was fairly similar. 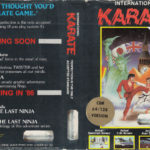 Interestingly, in the sleeve of International Karate, along with Last Ninja – two other further titles are announced for 1986 in the form of Last Ninja: Return of the Last Ninja and Revenge of the Last Ninja. Martin/Stadium64 wonders if the two parts would have just been some of the later levels split into a sequel of some kind. They didn’t get far anyway, possibly after the first game got delayed like it did. A massive thanks to Jazzcat, Mark Cale and Hugh Riley for finally clearing up the story behind the game! 1) Do you have any other names for the developers? 2) The maths teacher suggested you had a tool called the “Integrator”, which the levels were created with. Can you tell us anything about this level creator? 3) Is there any chance that the “Integrator” (or anything of the old version) survived today? 4) There was a rumor that the UK company that released the game, never paid Andromeda for their hard work. This sounds a bit of a harsh claim, is any of it true? 5) Did Andromeda develop/design Last Ninja from scratch themselves, and System 3 purchase the game from you when you hit troubles with the game? 6) Rumour has it that the original game was programmed in Forth – is this true? 7) Is the final released game (http://www.lemon64.com/games/details.php?ID=1488 ) much different from the game you worked on? There is this new docu titled Moleman 4 – Longplay which recounts the so far little-known story of the beginnings of video game development behind the Iron Curtain. It has a 10 mins part on the Last Ninja development in Hungary. I think it can answer any questions about the Hungarian developers. They were not students but most of them had degrees in mathematics research. They developed their own language to be able to deliver the game on different platforms at once. They had some of the levels done, but they missed all the deadlines.